For some reason we decided to grill on the July 5th “holiday” rather than on the 4th this year. We made turkey burgers and three salads. I was inspired by two recipes in the food section in our paper on Thursday – one of the salads was Moroccan. It reminded me that many Moroccan meals consist of a grilled or roasted meat and several side salads. 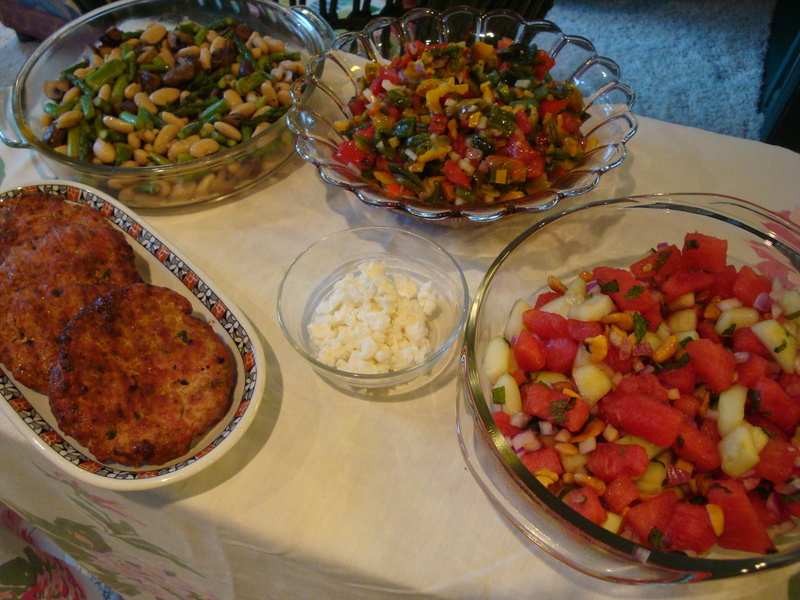 Another salad recipe was for a bean salad with the suggestion of serving it as bruschetta. I thought this could work as just a salad or bruschetta as recommended. My plan was to make the these two salads to go with the turkey burgers. Then, my upstairs neighbors called and asked if I wanted part of a watermelon. I said yes, and I was off and running to make a watermelon salad that my friend Karen had told me was a “must make” a while back. So here is our July 5th cookout menu – Whole Foods Santa Fe turkey burgers, White Bean- Asparagus-Mushroom Salad, Moroccan Grilled Pepper Salad, and Watermelon-Cucumber Salad wtih Feta. (Just click on the salad name to go to the recipe.) I recommend iced tea with mint and lemon or a dry French rose with this meal.